Looking to start playing ukulele? Well, choosing the best ukulele for a beginner is the most important decision because it will not only affect your ukulele journey but also decide your love for ukulele. You may give up playing ukulele after the first try, or you may become an expert, it’s all from your selection of the first ukulele. There are tons of ukuleles from different brands and you don’t know which one is suitable for you. Then you are in the right place, at the right time. If you are thinking of purchasing a ukulele, it is necessary to get all information about ukulele brands, ukulele type and its cost. The following buying guide will help you to make the best decision today. There are hundreds of ukulele brand available in stores, but they can only be their best when they find their most suitable partners. Over time, the ukulele world becomes more various with different types and each type has its most favorite brands. Therefore, if you would like your ukulele skills to improve, you should spend time on looking for your best ukulele partner. As a ukulele beginner, you should buy a Soprano Ukulele model to start with. Buying your first ukulele is the biggest step in your musical journey, and Kala Ukulele is a ukulele brand which can help you to make a big movement in your ukulele skills. Kala Ukulele is a new ukulele brand, but has a lot impacts to ukulele beginners. Kala brand develops plenty of ukulele models nowadays, and for every model it has made different sizes: soprano, concert, tenor, and baritone, which is suitable for every ‘prissy’ customers. That’s why Kala gets its reputation for the best-selling ukulele brand. Kala KA-15S is an ideal ukulele for small kids because it is the smallest ukulele compared to others. KA-15S has a traditional mahogany body and neck, which delivers a bright and lively sound without focusing too much on either end of the tonal spectrum. You can enjoy a warm, smooth, but powerful tone, and enough volume to perform in a group at the picnic or garden. This ukulele’s satin finish and geared tuners provide an antique, and well-played feeling. You can always feel that your ukulele is well cooperating with you to stay in tune. KA-15S was made of Rosewood fingerboard and bridge which is durable, strong, and aesthetic. 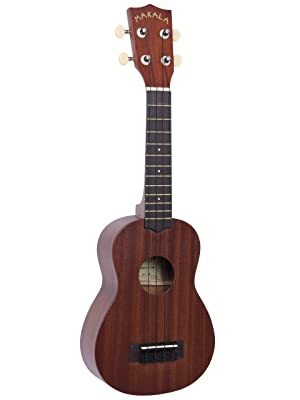 If you are a guitar expert, you would see that this product is really an excellent ukulele for beginners because of its deep shade of brown wood with a dark black grain running through, and the visible wood pores. Moreover, the fretwork is much better than $400 guitars. An old woman reviewed KA-15S as a fresh approach to the ukulele. Her grandchild was five years old when she first performed her ukulele song with KA-15S and it was a great performance. This ukulele does not require any complicated set up or skill to be able to control. Similarly, it is easy to tune or re-string this ukulele, even when you ended up incidentally breaking any string. Cheap but well-made ukulele for beginners. The case and tuner makes it a wonderful deal as well. The ukulele bag comes with quality Aquila strings. There is no buzzing on the fingerboard. A bit hard to play for those with bigger fingers or larger hands because of its small size. Prepare a tuning machine to slip because this ukulele holds its tune not so long. Kala-15S Mahogany Soprano Ukulele is an affordable and well-made ukulele for beginners, especially young kids. Compared to other ‘same-price’ ukulele, this product is cheap for its brand’s reputation with a beautiful overall construction, qualified strings, durable wood, nice frets and cool sound. Your kid would fall in love with it just after the first try. Another soprano ukulele was introduced from the Kala brand for ukulele beginners is Kala MK-S Makala. This produce set brings to buyers a MK-S ukulele, a gig bag, digital clip-on tuner, an instructional DVD, and a polishing cloth. Everything you need to start playing is all-in-one. Instead of spending money many times on buying ukulele accessories, you will just need to order a bundle which involves all necessary stuff. This ukulele is considered as an excellent ukulele not only for beginners, but also intermediate players. Highlighted features of this ukulele are mahogany neck, which produces a focused sound, Agathis body, and rosewood fretboard. It is easy to keep your MK-S ukulele in tune by its digital chromatic clip-on tuner. You can play creep by Radiohead with this ukulele. Moreover, you can find all instructions on playing ukulele by watching the DVD. The polishing cloth is well-made though it is a little bit small for the ukulele. The gig bag is also nicely designed. The instrument is made of laminate wood which is not solid. You can enjoy a clear sound, deep and loud tone on all frets. The more you use it, the longer the tune can hold. Anyone can easily carry this tiny, lightweight, and straight neck ukulele around with shoulder or hand. Easy-to-play even for players with big hands. The gig bag does not have extra pockets on it. If you would find an all-in-one ukulele to start with, MK-S Makala is your choice. Cheap price, beautiful sound, nice looking, easy-to-use, well-made are all highlights of this product. It is not only suitable for beginners, but also for players who want to make a transition from a ukulele player to a guitar player for folk singing or worship music. The journey of learning ukulele does not just stop at skills, but need the right instrument which can strengthen your ukulele ability. Standing at number 6 in the top 10 of best ukuleles, Hola! Ukuleles do not disappoint anyone who playing it. Moreover, it is a cheap option for players who want to save money but still perform great songs with excellent sound. Hola! Ukuleles’ top, back, and sides are constructed of solid maple wood. This brand develops ukuleles with various colors and types, so people can choose their favorite color and type when buying. Hola! HM-21 Soprano Ukulele, Color Series (Mahogany) is famous for receiving good comments from people who using it. 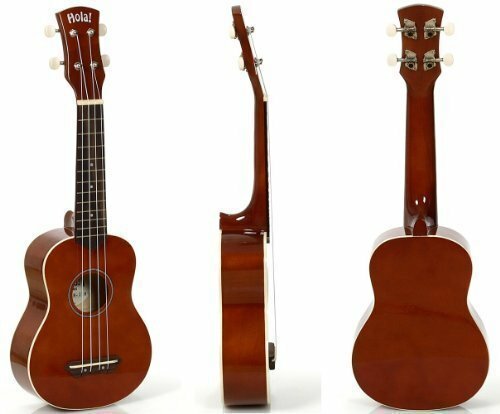 As other ukuleles, the Hola! HM-21 is strong and durable with maple construction. Some highlighted features of this ukulele are rosewood fingerboard and bridge, mahogany neck, white nylon strings, traditional white ABS binding, nut, and saddle, silver geared tuners, and 12 silver nickel frets. Fret position marks at 5th, 7th, and 10th fret. Its nut and bridge are at the right height for children’s height. The ukulele comes with qualified strings, but since the nylon strings need some time to stretch before they stably stay in tune. The ukulele is made of actual wood but not plastic wood laminate as other same-priced ukuleles. Its tune is also clear, nice, and not buzzed at all. The straight fretboard and strings spacing are convenient for players with small hands. The paint is applied very well, so you wouldn’t be afraid of fading color after long time of using. Does not stay in tune smoothly, needs better strings to hold tune. For a cheap musical instrument, we can’t expect a very high quality ukulele. However, Halo! HM-21 will go beyond your expectations with its metal frets and silver geared tuners, excellent strings, and good looking. A professional ukulele player would want a more expensive ukulele, but this choice is perfect for a beginner. We have looked at 6 different soprano ukulele types for beginners, the next ukulele we will review is a bigger ukulele. Soprano ukulele is perfect for kids and players with small hands, but for those who have larger hands, a Concert ukulele is more suitable. A concert ukulele has size of 23’’ in length, has 15-20 frets. Moreover, it has a fuller sound and more tension on the strings which can avoid strings to tune out, compared to a soprano ukulele. Among various ukulele brands, Luna introduces a concert ukulele which has become a popularity in the ukulele market, called Luna Tattoo Mahogany Soprano Ukulele Bundle. At the top of the ukulele, there is the laser etched design which makes it look more beautiful and special compared to other ukulele types. It can be a tattoo, flowers, peace sign, or turtle. Not only the look, but the sound is also incredibly great. The ukulele is durable with laminate wood and a mahogany outer veneer. When you look closer to the top back and sides, they are quite plain. The finish is in satin and the edges are unbound. The tune is well stayed which you won’t have to tune it often or change the strings. Some people reviewed that it had few defects about the color which somehow is drippy looking. If you love traditional body ornamentation with symbols represent for Hawaii such as stones, turtles, fish, rain, sun, etc, this ukulele is a good choice which stands for a long and lively life. 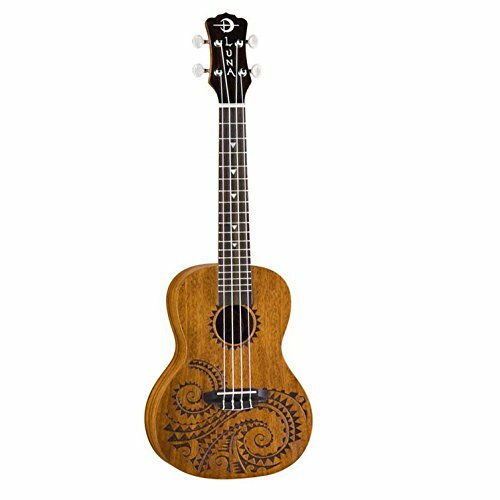 With all highlighted features of quality strings, great sound, concert size, and affordable price, you won’t regret your decision of purchasing a Luna Tattoo Mahogany Soprano Ukulele Bundle for your ukulele lessons. Oscar is a highly recommended ukulele brand by experienced ukulele players for beginners. Its highlighted features are mahogany body, bound mahogany neck, and a beautiful semi satin finish. Its quality goes beyond people’s expectation for a cheap instrument with low action, good intonation, great sound, geared chrome tuners, and smooth fret ends. Moreover, Oscar ukulele brand is the leader of the ukulele world for developing various ukulele series such as Koa, Comfort, Spalted Mango, Solid Mahogany, Spalted Maple, Mahogany, and Spruce Series. Every series has its own strength and weakness, depending on different players’ demands. 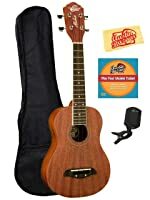 If you are looking for a ukulele set to begin with, this bundle would be your perfect choice, including a concert ukulele, gig bag, instructional DVD, a tuner, and a polishing cloth. You can save quite a lot money on purchasing this set instead of buying separated ukulele accessories. Compared to Kala MK-S bundle, this bundle is quite more expensive, about 90 bucks. The ukulele in the bundle is a Oscar Schmidt OU2 Mahogany Concert Ukulele. It includes all features that other Oscar ukuleles have: rosewood bridge, chrome tuners, mahogany top and back, and satin finish. Concert size of the ukulele is again suitable for big-hand players. It is well made and has a wonderful sound. As other ukuleles, you will need to tune it often at first, but this ukulele holds its tune quite well later. You can play it in the crowd or at the beach since it is quite loud. Again if you are a ukulele beginner and would want an all-in-one ukulele bundle, this set is your perfect choice. Well tuner, good looking, great sound, quality wood and finish, concert size are all this ukulele’s highlighted feature. It is also a very good budget ukulele. By now, have you found out the answer for the question of the best ukulele for beginners? Maybe you are more confused because we have reviewed so many ‘best’ ukuleles. Then, let us cut to the chase, two good options you can consider to purchase are the Lanikai LU-21 and Kala KA-S.
Well, they are all Soprano laminate ukuleles, made of mahogany laminate wood with mahogany veneer on the outside. Both of them have rosewood fingerboard and bridge, 12 frets, geared tuners, and Aquila strings. In general, their quality is quite the same. If we need to compare between the Kala and Lanikai, then the Kala ukulele’s sound is not as rich and full as the Lanikai ukulele. To summarize everything we have talked so far, what should ukulele beginners consider before purchasing their first ukulele? Before selecting any ukulele, buyers should consider the ukulele size, materials, brand, and budget in order to make the best ukulele choice. Again, there are four different ukulele sizes for your choice: the soprano at 20 inches (51 cm), the concert at 23 inches (58 cm), the tenor at 26 inches (66 cm), and the baritone at 30 inches (76 cm). The bigger size is, the bigger its body and neck, which is easier to handle. The sound is also louder, deeper, and more resonant. Therefore, soprano and concert ukulele are often suitable for beginners, tenor and baritone are for professional players. People use different kinds of wood in making ukuleles. The wood quality mostly decide the price and durability of the ukulele. In general, higher quality ukuleles are made from solid or laminate wood, but the price is also higher compared to others. Solid-wood ukuleles tend to mellow after time which create richer sound and tones, while laminate-wood ukuleles seem to not improve the sound and tone. Some popular ukulele tonewoods are Koa, mahogany, spruce, cedar, rosewood, and maple. Expensive ukuleles are often made from Koa wood which has beautiful grain, warm sound, and plain amazing. Mahogany wood creates softer sound and less expensive than Koa-wood ukuleles. We can’t help you more on this. We have reviewed 8 models from 7 different brands so far and we hope you have found your perfect ukulele brand. There are two types of ukulele: acoustic and electronic. Acoustic ukulele is more suitable for ukulele beginners who want to play for fun and do not need recording feature and using it for professional performances. Many people are wondering how much they should pay for their first ukulele. Well, it is all depend on you. Nowadays, different ukuleles are available at affordable price for players to purchase. Mostly people choose to start with a cheap ukulele first, then spend about $5-10 to buy better strings to replace the ‘not very good’ original strings. Well, buying a new one is always a better decision in this case. For musical instrument, buying a used one can’t save you a lot money or create a better quality while playing. Of course there are some used ukuleles still good and new for you to purchase, but most of the case people sell their ukulele because they no longer find it useful. Also, a new ukulele is not that expensive, so buy a new one and be its first owner. In the end, it is important to spend some time on doing good research about the ukulele that works for you, a ukulele that is good to play and hear and helps you to enjoy playing even after years. Kala KA-15S Mahogany Soprano Ukulele seems to have garnered all the best reviews from the pack. We hope this guide has helped you somehow in choosing your first ukulele or a ukulele gift for your children. Hopefully you have enjoyed reading our buying guide, now it’s time for you to shop online or go to a music store to purchase the best ukulele for beginner. Tummy Tuck Belt As Seen on TV [Reviews] | Does it work?